One of my favoured remedies for the excesses of Christmas is a port and brandy, recommended many years ago by an elderly barmaid in a pub overlooking the sea at Cromer; we remember her with affection whenever indigestion demands a cure. The other remedy is a long walk, preferably one through unfamiliar territory or familiar places seen from a slightly different angle. So to speak. On Boxing Day we stuck to the familiar circuit - Regent's Canal, Victoria Park, Hertford Cut, Mile End Park, home, cup of tea. A few days later, up for an adventure, we decided to follow the course of the River Tyburn, courtesy of Tom Bolton's Lost Rivers of London, from the heights of leafy Hampstead to the infilled marshes of Pimlico. I'm not sure I can convey how stupidly exhilarating this walk was. It may have been the slight stir-craziness of Christmas, or possibly the heady Hampstead air or, as I like to think, the sheer delight of a quest for something largely unseen. 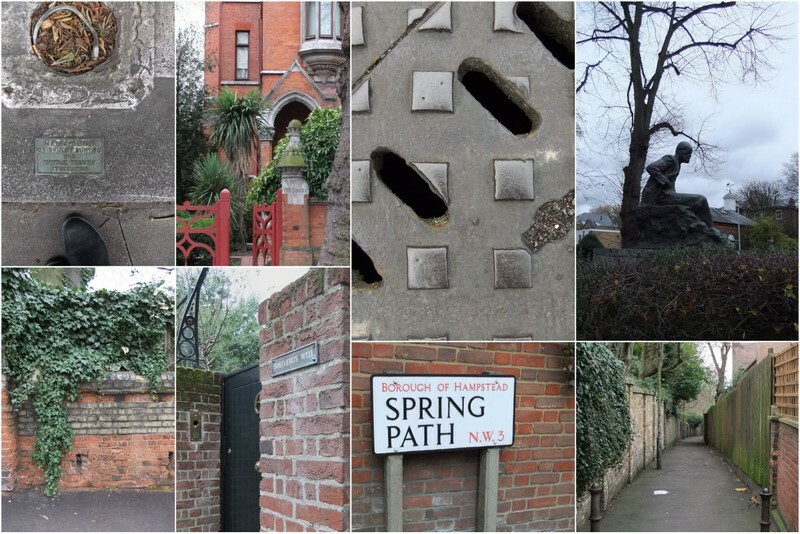 It was a fascinating journey through the physical and human landscape carved by a small river, now hidden in culverts and pipes, where you can still see the dips and slopes left behind as the river meandered its way to the Thames. The walk starts near Spring Path and Shepherd's Well, past the gothic villas and mansions that, thanks to Sigmund Freud's choice of home, now seem to house the greatest density of psychiatrists in the country. At some points you come across manholes in the road where you can hear the hidden water - murkiness unseen - if you brave the middle of the road and put your ear to the vents. As I did. One of the pleasures of a walk like this, following on from days of languor, is that you know you are in for an easy time as it is going to be downhill. Below Hampstead and Swiss Cottage, you cross the Regent's Canal taking you into the Regent's Park. An aqueduct built into Charlbert Bridge carries the Tyburn across. The river runs into the Boating Lake with exotic ducks fenced in, too soppy to venture across. John identified scorp, smew, pochard, mallard, shelduck, mandarin and tufted ducks, as well as Hooper swans and ubiquitous herons lurking like predatory clergymen. Another manhole in the middle of the Outer Circle gurgled obligingly from the depths below. South of Marylebone Road the route became more interesting because, despite the greater number of people, you actually follow the serpentine course of the river in some places like Marylebone Lane - "a winding, contrary route". According to Tom Bolton "it was once a country lane running through fields alongside the Tyburn before eighteenth century London hid the lane and the river among newer, grander roads". Going through St Christopher's Place and looking up at the decorations, you might even feel like a fish gaping up for air. Across Oxford Street - surging through shoppers - there are more meanders down back streets behind posh shops. The gentle slopes and occasional cast iron grilles confirm the course. Brook Street is raised to cross the Tyburn below, then curves gently downwards again through narrow Avery Row. Crossing Piccadilly into Green Park you can see where the river has carved a valley which graduates gently through the park down towards Victoria. 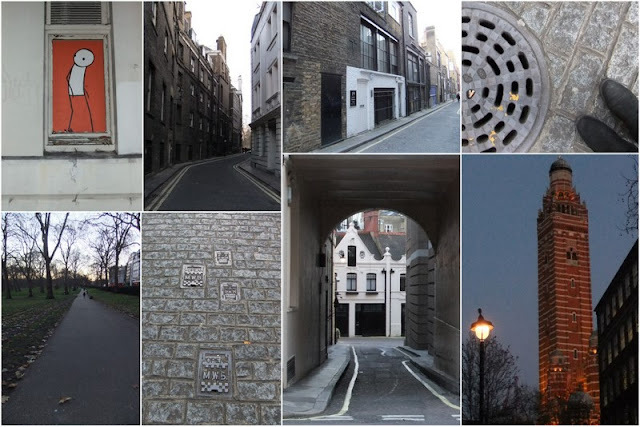 The last section of the walk again takes you beyond Victoria through back streets like King's Scholars Lane, towards the flatlands of Pimlico, Aylesford Street and the Tachbrook Estate, where the last exposed area of the Tyburn was finally put undercover in the 1960s. Opening the gate under the arch of the appropriately named Marsh House, you finally come to the point where the Tyburn trickles into the Thames. By the time we arrived it was dark. We looked across to the south bank where the River Effra flows in. I like the name. It may well be the next quest. We made do with a cup of tea at the Tate before we followed the Thames homewards. By Tube. I love walking in London and this post captures the flavour of it so well. Happy new year and may you have many exhilarating walks in 2012! What a splendid post with marvellous images. I loved the one of you bending to the manhole cover -- I don't think I could do that as I would fear the smells rising from it. Very happy new year, and I will look forward very much to all your posts. 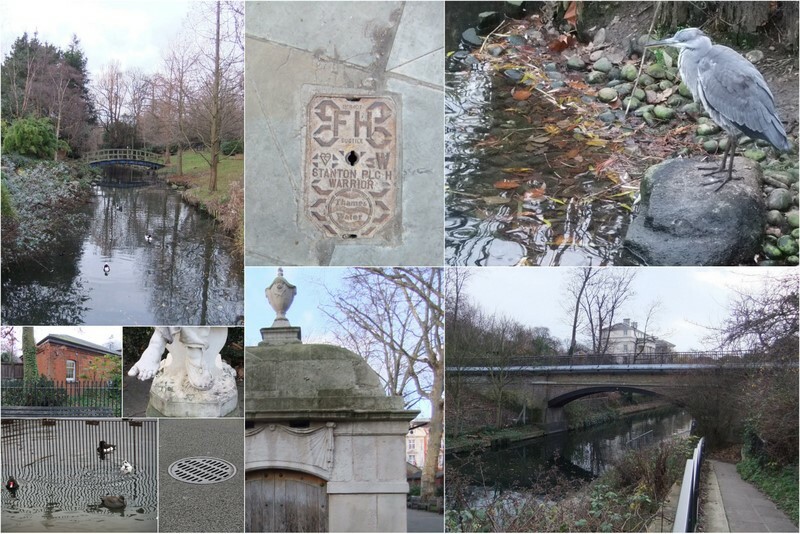 Sounds like a fabulous walk - I love discovering new ways of exploring familiar parts of London and how exciting to track a river. The photos are beautiful - I especially like the cathedral on Victoria street. I also love the photo of you listening to the sounds and your beautiful string bag.